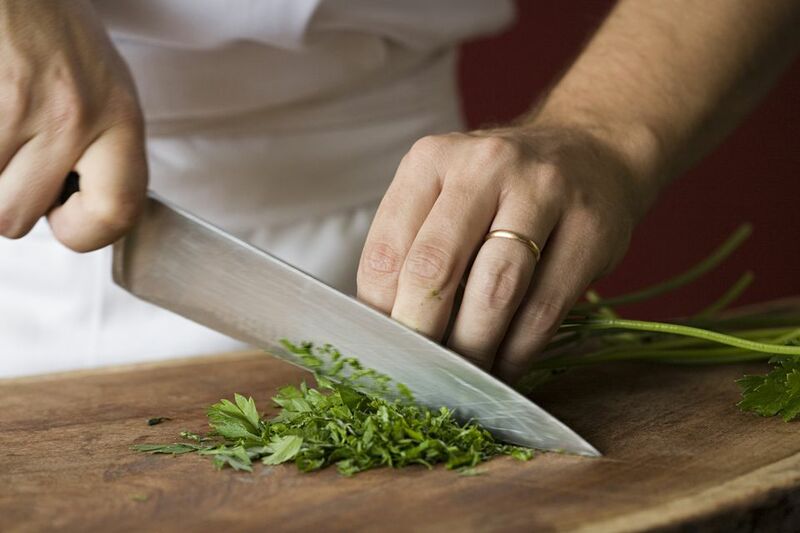 Whether you are a novice cook or know your way around the kitchen, honing your knife skills is not only important for keeping you safe but will make your recipes that much better. Ingredients that are cut uniformly cook at the same rate and result in a dish that is cooked properly throughout. Since each piece of food is cut in the same fashion, the finished dish will have a nice presentation. This tutorial will cover the correct way to hold a chef's knife as well as how to grip the food with your other hand to avoid cutting yourself. This photo shows the appropriate way to grip a blade. Note how the index finger is wrapped fully around the blade. The index finger and thumb should be opposite each other on either side of the blade while the remaining three fingers are sort of loosely curled around the handle. You should be gripping the knife mainly with the thumb and forefinger. If you find that you're tightly clutching the entire handle of the knife, just relax and loosen your hold. With practice, you'll get used to this grip, and soon any other grip will feel unnatural to you. Now that ​your knife hand knows what to do, you need to make sure your other hand does as well. Your non-knife hand is called your "guiding hand," and its job is to hold the food to keep it from sliding around on the cutting board. This puts that hand in a uniquely dangerous position. With the knife blade quickly moving up and down, you need to keep those fingertips tucked safely away, while still being able to firmly hold the food. The grip shown here is called the "claw grip"—by keeping the fingers curled inward and gripping the food with the fingernails, the fingers stay out of harm's way. The side of the knife blade should rest against the first knuckle of the guiding hand, helping keep the blade perpendicular to the cutting board. In this modified version of the claw grip, the first knuckle of the guiding hand rests flat on the ingredient, with the fingers again curled inward safely. This time, the knife rests against the second knuckle rather than the first. Both of these claw grips is acceptable, so use whichever one you feel comfortable with. You may want to start off with chopping an onion to practice getting comfortable with how to use a chef's knife. Are You Sharpening Your Knives at the Right Angle? What Does a Batonnet Knife Cut Look Like? How Tiny is a Fine Brunoise Culinary Knife Cut? Are Your Kitchen Knives as Sharp as They Should (or Could) Be? What Is a Granton Edge Knife and Why Is It So Popular? 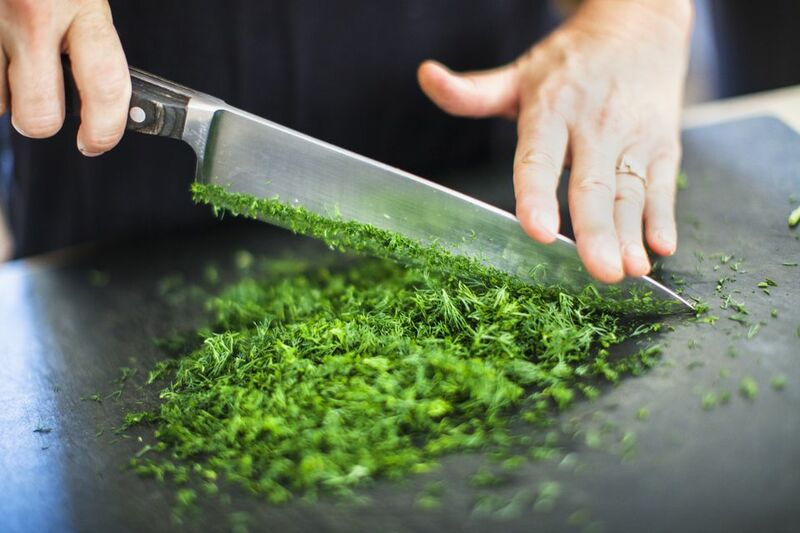 What Does Chiffonade Mean in the Culinary Arts?